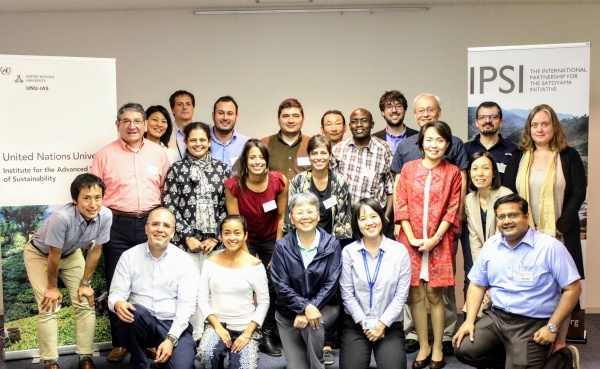 A workshop was held by the IPSI Secretariat from 22 to 24 May 2018 at the United Nations University Headquarters in Tokyo, Japan as part of the process toward the publication of the fourth volume of the “Satoyama Initiative Thematic Review” (SITR vol. 4). The theme of this year’s workshop was “Sustainable use of biodiversity in socio-ecological production landscapes and seascapes (SEPLS) and its contribution to effective area-based conservation”, covering how the sustainable use of biodiversity as practiced in well-managed SEPLS can contribute to effective area-based conservation of biodiversity. The objective of the workshop was to share case studies among the SITR vol. 4 authors and get feedback on their manuscripts for further improvement. Participants shared a wealth of opinions and suggestions about how a variety of SEPLS management practices and approaches can contribute to both area-based conservation and human livelihoods, taking lessons from IPSI case studies from around the world. The SITR vol. 4 is planned for publication later this year, and will have the same theme as the workshop, including write-ups of the case studies presented and a synthesis paper aimed at bringing together the various projects and extracting lessons learned.